The original soundtrack for the groundbreaking TNT series “Arthurs Law” is now available on Alhambra Records featuring musicians from the D.S.O. Berlin, multi-instrumentalist Jan Lehmann as well as Tokyo-based singer and artist Ayako Ikeda. In February 2019, the O.S.T. will be also released physically on CD by legendary Kronos Records. Largoland's Christoph Blaser delivers a moving and, at the same time, edgy score for director Christian Zübert’s provocative series which is filled with dark and scathing humour. Tune in and read more. Luxlotusliner wins the prestigious Red Dot Award for their innovative communication design of Polsat Sport featuring music composed by Largoland. Congrats! 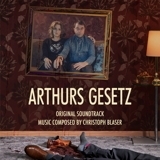 Christoph Blaser teamed up with good friends filmproduktion and TNT Comedy for the score of “Arthur’s Law”, a TV mini-series directed by Christian Zübert. Arthur's Law had been nominated for the international series competition of the Zurich Film Festival 2018 as well as for the prestigious Grimme Awards and Deutsche Fernsehpreis. Furthermore the series had been snagged by US network TBS and will be shown in the US with English subtitles.